Happy Thursday Sweet Friends. I wanted to share a couple of Project Hope Events with you and would love for you to help spread the word. Exciting things are happening that I only owe to God and His favor on this project. He is opening doors and aligning me with some amazing people! I realize many of you are not from San Antonio or the surrounding areas, but maybe you are? Or maybe you would considering traveling here for the event which would basically just blow my mind with gratitude. Or maybe you can't come but want to pray for us and for the event, that lives would be touched through not only the boxes, but those decorating them. That would be amazing too! 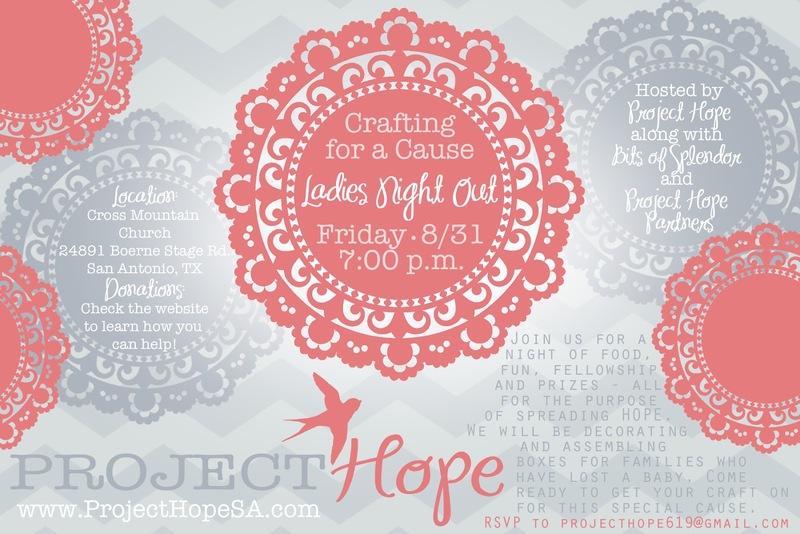 Our Crafting for a Cause event will be Friday, August 31st. This will be sort of a "Ladies Night Out" with food, door prizes and other surprises. This is meant for all women, so grab your girlfriends, or your womens group and make a night of it. We will all be working together to decorate 100 boxes special and unique. Even if you aren't "crafty" or think that you are...come. You never know what could happen to your creative juices when we put a glue gun in your hand sister! Also, we are holding a Donation Drive here in San Antonio for all those who want to donate to the project as well. We are in still need of a few items, mostly hats, booties and lovies! 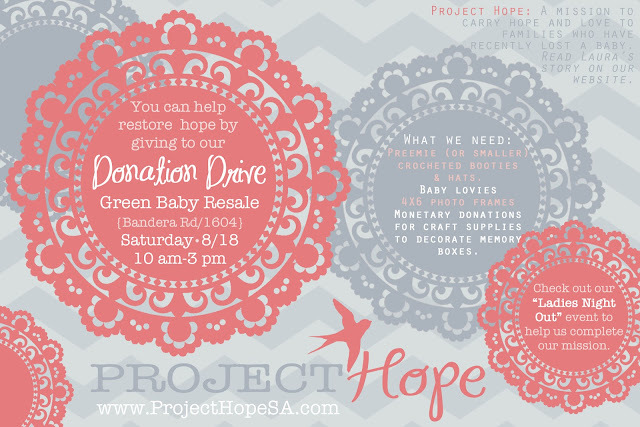 Also monetary donations for the purchase of craft supplies and the boxes. This is the time to come say hello, hug me, and drop off your donation! Green Baby Boutique is hosting us and will serve as the location. They are located right near the new HEB Plus so if you are like every other San Antonion and want to come scope out the biggest HEB in SA like it's a tourist attraction, this would be your day! AND Green Baby offers kids & baby resale clothes at great prices too. Nice brands for half the price. I get a lot of my kids clothes from them when I'm looking for a deal. Which we all know, is always. If you go "like" their facebook page and they get to 1500 before the 15th, they will have a huge sale that weekend as well! So please do me a favor and go "like" their page for us! Got any questions about Project Hope? Want to donate? Contact me at projecthope619@gmail.com. You can also share the invites and the website with your friends and family as well. www.projecthopesa.com will take you directly to the Project Hope page here on my blog. This streamlines all of the project hope info and makes it easy to find! this is seriously awesome, what you are doing here. i may actually be in san antonio that weekend (we are taking my little guy to sea world for his 2nd birthday) so i may get to come. i would LOVE to help!! i will definitely check out the website for more info. brittany, that would be so fun!! i hope it works out and you are able to come! wow this is so cool! I wish I was in the area. I would love to come!